Description: Camp Hoover was built as a retreat for the president and dignitaries of foreign countries. Its function was similar to the currently used retreat, Camp David, in central Maryland. This is a moderate 10 mile circuit in the SNP. Although Camp Hoover is the focal point of the hike it uses greater segments of foot trails and less mileage on fire roads as utilized in other treks to the camp. You’ll start at the Byrd Visitor Center. 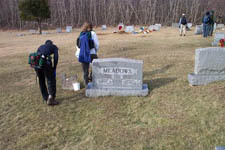 Your first stop will be at the still used Tanner Ridge Cemetery. Here you will discover where places like Big Meadows, Jenkins Gap and Weakly Hollow Forest Road got their names. From there you’ll hike along about 3.3 miles of the sweetest stretch of the AT as far as trail surface is concerned. This entire stretch is smooth with little or no rocks. Actually, a lot of it is grassy. You’ll then descend to the Camp on the Laurel Prong Trail. After you finish soaking in the history you’ll return to the Visitor Center via the Mill Prong Trail, Mill Prong Spur Trail, a very small segment of the Rapidan Fire Road and a neat diversion through the Meadows. The hike starts behind the Byrd Visitor Center. Trail Notes: From the Visitor Center head south on the shoulder of Skyline Drive. 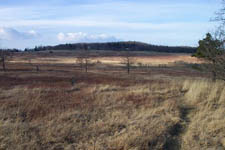 Cross the south entrance of Big Meadows and walk through a picnic area. At 0.28 miles from the start arrive at a gated, gravel service road with a concrete sign post directing you to Lewis Spring (Way Point 001A). Turn right here but in a few yards turn left onto an unsigned but blazed (yellow) bridle trail. In about 0.38 miles arrive at gravel Tanner Ridge Road (Way Point 001B). Turn right and follow the road to the cemetery. After checking out the grave stones, turn right onto the AT (Way Point 002). In another 1.03 miles arrive at the Milam Gap parking area on Skyline Drive (Way Point 003). Cross the Drive and continue on the AT passing the trailhead for the Mill Prong Trail. Slowly climb up to Hazel top, enjoying partial views east of the valleys and peaks. Descend and at 2.34 miles from crossing the Drive arrive at the junction of blue-blazed Laurel Prong Trail (Way Point 004). In another 0.9 miles arrive at the junction of Cat Knob Trail (Way Point 005). Turn left to stay on Laurel Prong Trail. Descend and in about 0.66 miles come to the first of several streams and springs that comprise the headwaters of Laurel Prong (Way Point 006). In 0.63 miles pass the junction of Fork Mountain Trail on the right (Way Point 007). Soon after this junction the blazes will change from blue to yellow although you are still on the same trail. Pass the “Five Tents” area on the left. 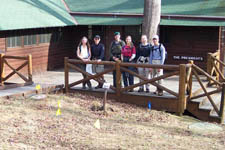 At 0.53 miles from the last trail junction arrive at Camp Hoover (Way Point 008). Check out all the history, splash around in the streams and take a nice break. Return to the junction of Laurel Prong and Mill Prong Trails. You passed it as you came into the camp. Follow the signs for Mill Prong Trail. Initially you’ll be following a gravel entrance road but soon look for and turn left at a concrete post marking the continuation of the yellow-blazed trail as a footpath that parallels the stream. 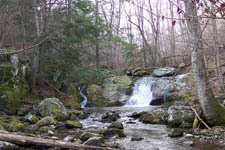 In 0.35 miles (Way Point 009) from leaving the camp, come to Big Rock Falls. Cross the stream under the falls and turn left to stay on Mill Prong Trail. Arrive at the junction of yellow-blazed Mill Prong Spur Trail in another 0.33 miles (Way Point 010). 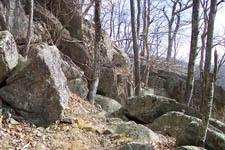 Turn right onto the spur trail and climb, steeply at times, for 0.98 miles to the junction of the Rapidan Fire Road (Way Point 011). Turn left onto the Rapidan Fire Road. From here it’s a matter of following it out to Skyline Drive and then returning to your cars. If you prefer a more scenic, softer route hike about 0.61 miles on the fire road until you reach the meadows. On your right will be a wooden sign, “No Horses”, marking a footpath through the meadow (Way Point 012). The path initially hugs the tree line until you come to a large pine tree. At this point turn left (west) and follow your nose back to the visitor center. There is a labyrinth of trails to choose from. The meadow is rich in a wide assortment of grasses and wild flowers in season. In about 0.56 miles after leaving the fire road, arrive at your starting point. Critique: Took Laurel Prong and veered off to right and up mountain, then down to The Sag and then down to Hoover's Camp. Back up Mill Prong to AT then back to car. Only problem was that this took me out of the park and hunters were tracking a bear with dogs. Hunting season is over as of 1/3/09. Beautiful day with temps rising into 60s. Moderate workout with plenty of ups and downs. Critique: We did this trail clockwise to arrive at Camp Hoover earlier in the day and also to do the vertical before lunch. Arrived at Camp Hoover before the van tour and had a private tour with a volunteer. We hadn't been there since the restoration was completed so this was our first time inside the buildings and it is worth the time to look at the exhibits. You have to go with a volunteer to get inside the President's cabin but the Prime Minister's cabin is self-guiding. Rest of the trail was very quiet with only a handful of hikers and a couple of deer (in prior years we have seen bears on the AT part of this loop). Note that if doing the loop clockwise when leaving Camp Hoover, just past Five Tents, there is an unmarked maintenance road that forks uphill to the right. Don't take it; the trail goes to the left. Also the bridle trail between the Lewis Spring and Tanner Ridge Roads is semi-maintained (high grass); recommend the use of the AT between those two roads which can be easily done.